This Just One review was made after playing the game about 10 times. We were sent a copy of this game by the publisher in exchange for an honest review. 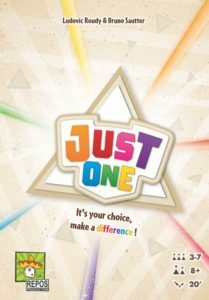 Just One is a cooperative party game in which you are trying to guess mystery words based on one-word clues that your teammates give you. The game was designed by Ludovic Roudy and Bruno Sautter (the creators of The 7th Continent) and is published by Repos Production. The rules for Just One are extremely simple. One person is the guesser each turn while the other players are writing down one-word clues for the chosen word. As a group, you’re attempting to get as many correct guesses as you can out of a maximum of 13. 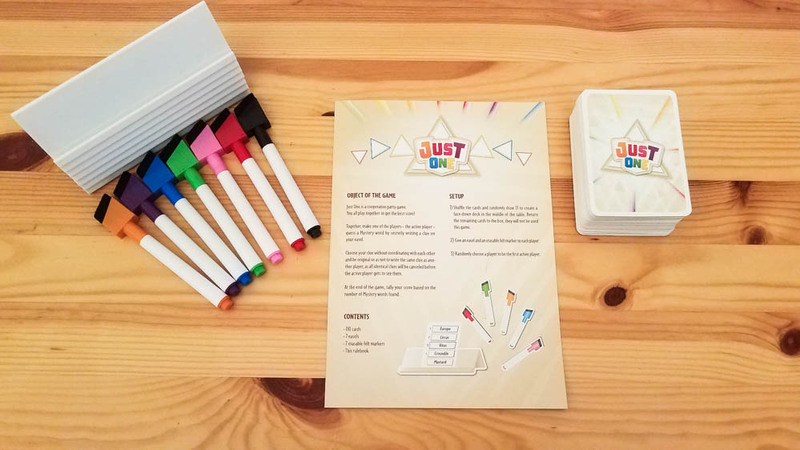 To set up the game, you grab 13 random cards and give each player a dry erase marker and an easel. Then all you have to do is decide who the first guesser will be. 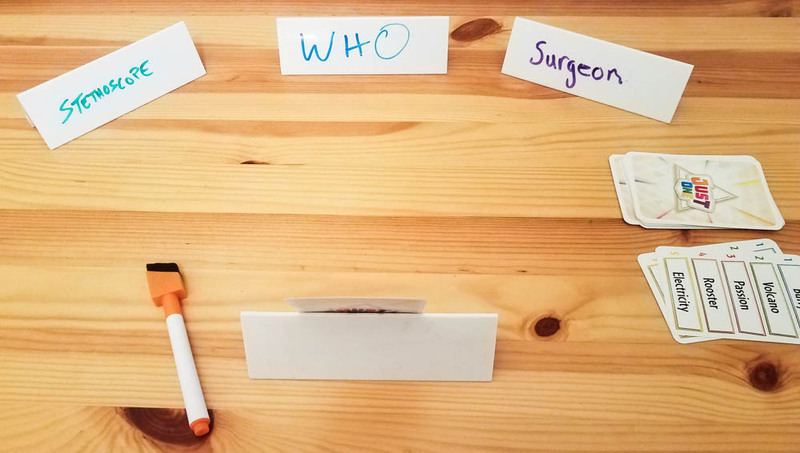 Choosing a Mystery Word – The active player draws a card, puts it on their easel so their teammates can see it, and then chooses a number between one and five. Clue Selection – All other players will write down a one-word clue having to do with the word on the card. In a three-player game, the clue-givers write down two clues apiece. Comparing Clues – The active player closes their eyes and the other players look at each other’s clues. If any of the clues are the same, they cancel each other out and those easels are flipped face-down. Guess – The active player opens their eyes, looks at the remaining clues, and attempts to guess the word. If they guess correctly, the card goes into the success pile. If they make an incorrect guess, that card and the top card of the deck are removed from the game. If they decide not to guess, then just that one card gets removed from the game. After that, the next player gets to be the guesser. Once there are no cards remaining, you’ll count up the amount of correct guesses that your team had and compare that number to the chart in the rulebook (7-8 correct guesses is considered an average score). I really like that matching clues cancel each other out. It makes you think a bit harder about what you’re going to write down and it makes it a more challenging game. It also creates some hilarious moments where two or more people think they’re being clever only to find out that they wrote down the same “clever” clue. Those easels are really cool. They’re easy to write on and they also double as card holders. Just about anyone can learn how to play this game in a couple of minutes. The three-player rules work well. I like that each player writes down two clues per turn instead of one, giving the guesser more to work with. This is a legit cooperative party game! There really aren’t that many of them out there. The dry erase markers are better than the ones found in games like Telestrations, but they aren’t perfect. A couple of them have been tough to erase off of the easels and the erasers fall out of a couple of the others. The four-player game is just okay when compared to the other player counts. You actually get fewer clues than in the three-player game since each player only gets to give one clue, which means there’s a higher chance the guesser will only have one clue to work with. I think there’s a good amount of replay value in the box, but more cards would have been great. Groups that play Just One a lot will start to see some of the same cards/clues pretty quickly. 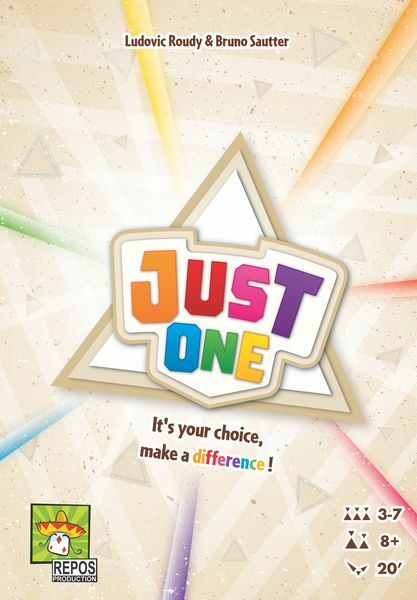 Just One is a game I think most people would be very happy to have on their shelves because it’s the type of game you can play with absolutely any group. It’s easy to learn how to play, you can play with larger groups, and it gives you a great mix of high-five and laugh-out-loud moments. It has that classic party game feel, but that one simple rule that has you cancel out matching words makes it feel unique. My group has had a great time playing Just One. I can definitely say that it keeps getting better as you add in more players, but it’s a solid game at just about all player counts. I do hope that Repos Production publish some expansion cards at some point to give the game even more replayability. I think I’d put Just One right behind Mysterium and Codenames Duet (with 4+ players) on my list of top cooperative party games. Thanks for taking the time to read our Just One review! To stay updated on all things cooperative board games, follow us on Twitter, Facebook, or via RSS.